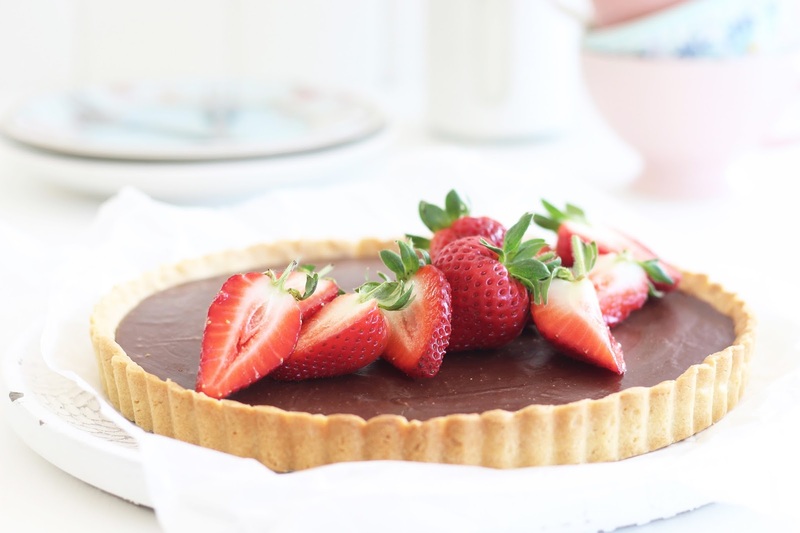 Who doesn't like a good chocolate tart? Silky and smooth, rich with chocolate flavour. 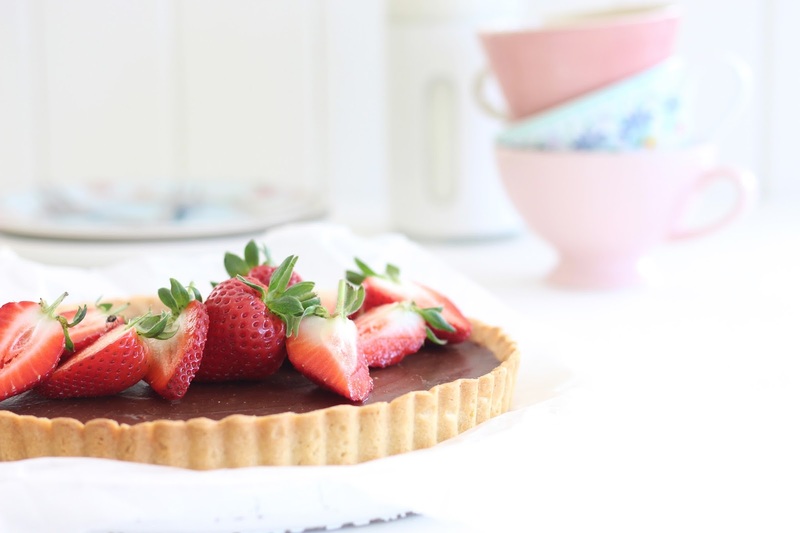 I really don't think a good tart could ever be a bad idea. I had been keen to try one out when I found Style Sweet CA's recipe on Pinterest. I knew I wanted a really good recipe and when I found Tess's, I just couldn't resist testing it out. I did do a tiny bit of tweaking, but this is definitely Tessa Huff's recipe in it's full glory. To read the original recipe click here. 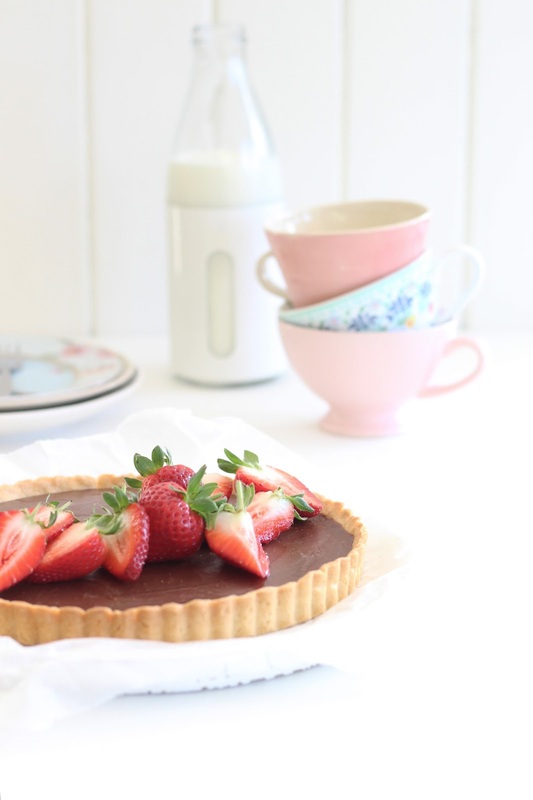 One of the things that made this tart so delightful was the pastry. It was buttery, crispy with just a tint of salt. I went with the classic fresh strawberries as the topping, it was the perfect finish. I also found the pastry easy to work with which isn't usually the case with me. 1. In a freestanding mixer beat the butter until smooth. Add the sifted icing sugar and mix in until creamy. Scrape down the sides of the mixer with a spatula, and then add the egg yolk and beat it it. 2. Turn the mixer on low and add in the flour and salt. Mix until it starts to form together. It might be a little crumbly. Add the cream and beat in. Be careful to not overbeat the pastry. 3. Tip the dough out and form a round disk and cover in cling wrap. Chill for an 40 minutes to an hour. 4. Allow the dough to come to room temperature before working with it. 6. Grease your tart tin lightly with spray and cook. Remove the top piece of wax paper from your pastry and flip the pastry into a 8 to 9 inch tin. Now remove the last piece of wax paper. 7. Mould the pastry into edges neatly. Pressing the dough down to make sure i'ts even. Trim the edges if needed by running a knife along the rim of the pan. Wrap loosely in plastic and allow it to sit in the fridge for 30 minutes. 8. Preheat the oven to 170* degrees. After the crust has chilled, place a piece of wax paper on top of the pastry and fill with beans to blind bake. Make sure the shiny side of the wax paper is facing down. Place the tart shell of a baking sheet and place in the oven for 15 minutes. After it has baked, remove the wax paper and beans and return the pie crust to the oven for a further 5 to 10 minutes. Allow to cool completely before filling. 9. While the pie crust cools. Chop up all the chocolate and place in a heatproof bowl. 10. Put the cream and butter in a saucepan over medium heat and slowly let it simmer. Once hot pour it over the chocolate and allow it to sit for a minute. Then whisk until the ganache is smooth and silky. 11. Pour the filling into the cooled pie shell. 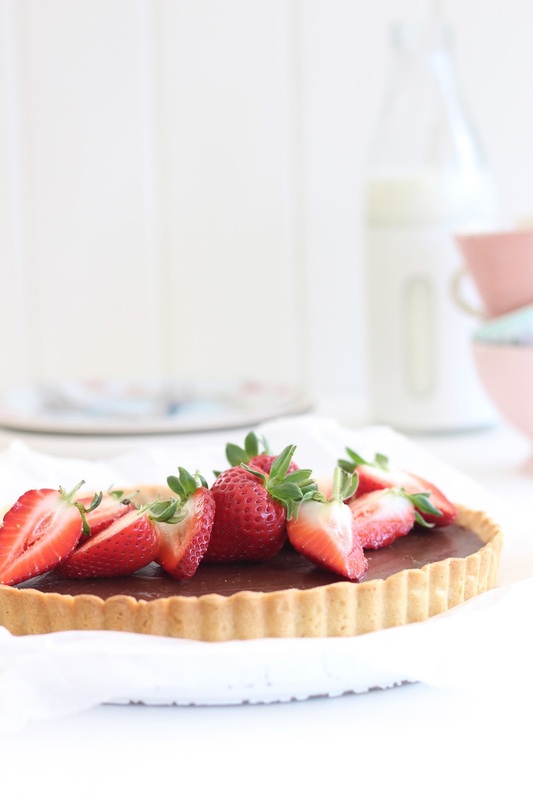 Allow the tart to sit and room temperature for a few hours or let it sit over night before serving. 12. Decorate with fresh berries of your choice.